Happy Halloween! This is the 25th anniversary year for both Altered Beast and Splatterhouse, this year’s monster/horror update will focus more on those two series. – Updated characters: Neff (Rhino form)for Sega. All Darkstalker’s Revenge characters have their Select/Vs. portraits from that game. Game Index – Splatterhouse (arcade) added. Sprites – Night Slashers finally gets a gallery with a few sprites and animations. Custom Sprites – Jennifer, Master Dead and Pumpkin King added to Namco page. Neff (Rhino) and Headless Horror added to Sega. Sorceress added to Vanillaware page. Ptolemy added to Taito. Skeletor added to Toys & Cartoons. 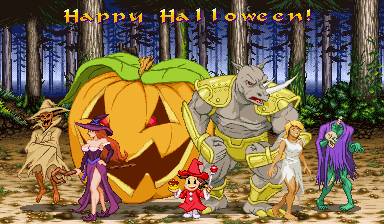 Fake Screenshot – Here’s one for the horror movie fans: Mike Haggar’s Halloween. VGJunk has a fresh page all about Splatterhouse 2 for the Sega Genesis/Mega Drive. Games-in-Bits has an excellent feature on some creepy urban legends in video games, including the first video game character to kill actual people. Arcade Quartermaster also added a Splatterhouse shrine along with one for House of the Dead! It’s a creature double feature of foreboding abodes, so check it out! Most of you probably know by now that Mighty No. 9, Shantae: Half-Genie Hero, and River City Ransom: Underground have all been funded (and RCR:U will still be open until Wednesday, October 9th). 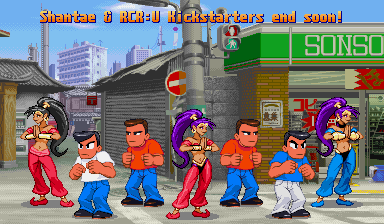 Those who missed out will have a bit of time to help out with stretch goals and/or pre-order the game on the River City Ransom.com Paypal page and Shantae: HGH page. It’s very satisfying to see these games funded by the fans who really want to see more games like this. This is the last small update to celebrate those three games and get a few things ready for Halloween. I’m still working on a commission project, so I couldn’t do as much as I wanted as that project has to come first. There won’t be any updates until close to Halloween. Technos: Slick (original RCR look) and Bannon (from RCR:U) in the same NES-like fighting scale sprites last week’s sprites were in. – Vs. Maker and GroupShot: RCR:U and RCR – Enemies (with Slick sprite) added. Shantae’s palettes were tweaked (blue eye/gem color added, not seen in sprite galleries yet). Back to commission work for me. I’ll be back in time for Halloween! This is another mini-update to keep the word out about the Shantae: Half-Genie Hero and River City Ransom: Underground Kickstarters that are in the final stretch. Shantae: HGH will be over on Friday and is working on stretch goals while RCR:U have 5 days of funding left but hasn’t hit its main goal yet. There are donation tiers that are basically full pre-orders, so please consider those if you’ve got the money to get those. Vs. Maker & GroupShot: Alex and Ryan get new fighting-scale sprites based on the NES sprites, and the infamous Dragon Twins do as well. Shantae gets more outfits and palettes. Fake Screenshot: Shantae (GBC) and Rick from Splatterhouse: Wanpaku Graphiti were added. Of course, congratulations to the Mighty No. 9 project for getting funded and hitting ALL of their stretch goal levels! It’s great to see creative people like Keiji Inafune, Manami Matsumae, Kimo Kimo, Tom Pon, and many others getting the praise they deserve and I can’t wait to play the game that they’ll make. The fans who love their work backed up that desire for more with deeds, not just by donating money, but by generating and spreading an infectious excitement that built enough momentum to raise $3,845,170. I know this sort of magic won’t happen for every game project, but I hope that we fans can continue to heed the call (no pun intended, maybe). Shantae: Half-Genie Hero and River City Ransom: Underground KS’s are still going, so please give if you can so that adorable half-genie girls and wide-eyed vigilantes can get their due, too.